"A slightly sweet and oh so tasty barbeque sauce that will have you licking your plate. The combination of ingredients is so simple, you'll be shocked. It's great for coating chicken or ribs, mixing with plain noodles or on top of white or yellow rice." 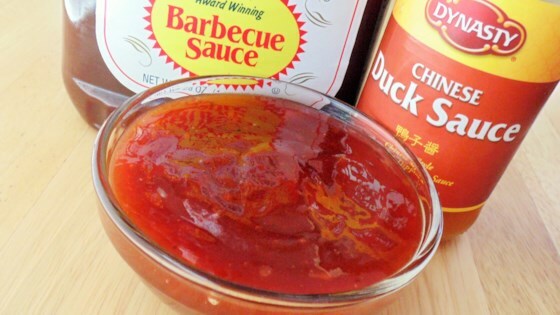 In a medium bowl, blend barbeque sauce and duck sauce. Chill in the refrigerator until serving. Kentucky bourbon leads a saucy cast of tangy, spicy, and sweet ingredients. this recipe is horrible, Im not sure if youve noticed, but there are literally thousands of barbecue sauces out there, it is very vague to just list barbecue sauce as one of the ingredients! Why didn't I think of this? Fabulous.